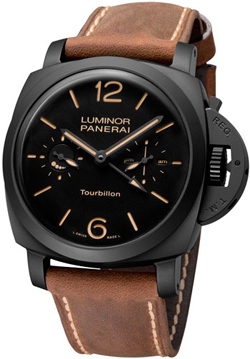 Known watchmaker Panerai developed a new model – Luminor 1950 Tourbillon GMT Ceramica (Ref: PAM00396). This amazing new product with a complex tourbillon proprietary balance wheel is wrapped around its own axis in 30 seconds, excluding the effect of gravity on the precision. Complement these features dual time display and LED 6-dneyanogo power reserve, which is provided by three wind-up reel. New Luminor 1950 Tourbillon GMT Ceramica 48mm round case is presented in 48 mm of ceramic, which was not chosen by chance. This material – synthetic ceramic based on zirconium, demonstrates the technical mastery of Panerai. For the manufacture of such material requires sufficient time. After a complex process of production and processing produces a unique texture and matte black casing, characterized by superior strength, resistance to scratches, corrosion and high temperatures. Black Dial New, executed in a minimalist style with the development of the 30-ies, for maximum readability in all conditions. Equipped with a dial with Arabic numerals, covered with fluorescent material, an additional window in the 3 o’clock position to display the current part of the day (am / pm), as well as sub-dial at 9 o’clock position, coupled with a tourbillon and makes one revolution every 30 seconds, that is, two times faster than it is located on the second hand. Sapphire crystal protects the dial of 2 mm thick with anti-reflective coating. The back of the model covers the transparent cover with a titanium ring under which “hides” mechanism P.2005 / B manufacturing. With manual winding mechanism, 9.1 mm thick, assembled at 31 stones, has a frequency of 28,800 vibrations per hour, 6-day power reserve. The total number of details caliber – 246. Mechanism with three reels equipped with functions: hours, minutes, small seconds, second time zone display am / pm, power reserve indicator, tourbillon. New Luminor 1950 Tourbillon GMT Ceramica comes on a leather strap brown color with a large steel buckle with black finish.